Every chef, each and every cook, has a repertoire of go-to recipes for catering a gathering. One of the standards on an African Relish function menu, surprisingly enough, is the humble samoosa. In the hands of our kitchen team though, this scrumptious little starter is far from humble. The story of the African Relish samoosa is a good one to tell. It tracks the typical genesis of the treasured recipes in our kitchen repertoire. The core recipes for the school often pass through the hands of a number of chefs and much testing and tweaking before they are stored in our archive. Recipes usually come out of a resident chef’s repertoire, or out of our collection of cookbooks. We’ll teach a particular recipe in a class, and the chef might think of a way to improve it as students follow the steps. Perhaps a student asks a question or makes suggestion that gets our chef thinking about modifications. The point is, recipes constantly evolve. The guidelines written down on a piece of paper are just that: guidelines. 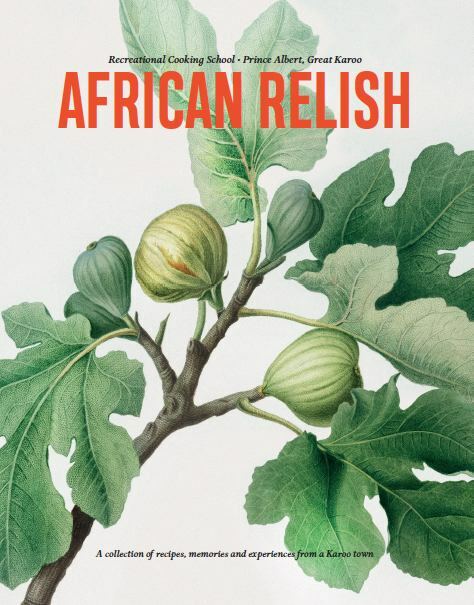 At African Relish, when a recipe makes it into the gold arena, its been tweaked, twiddled and tested under all conditions and for almost any tastes. Back to the little triangular beauties. 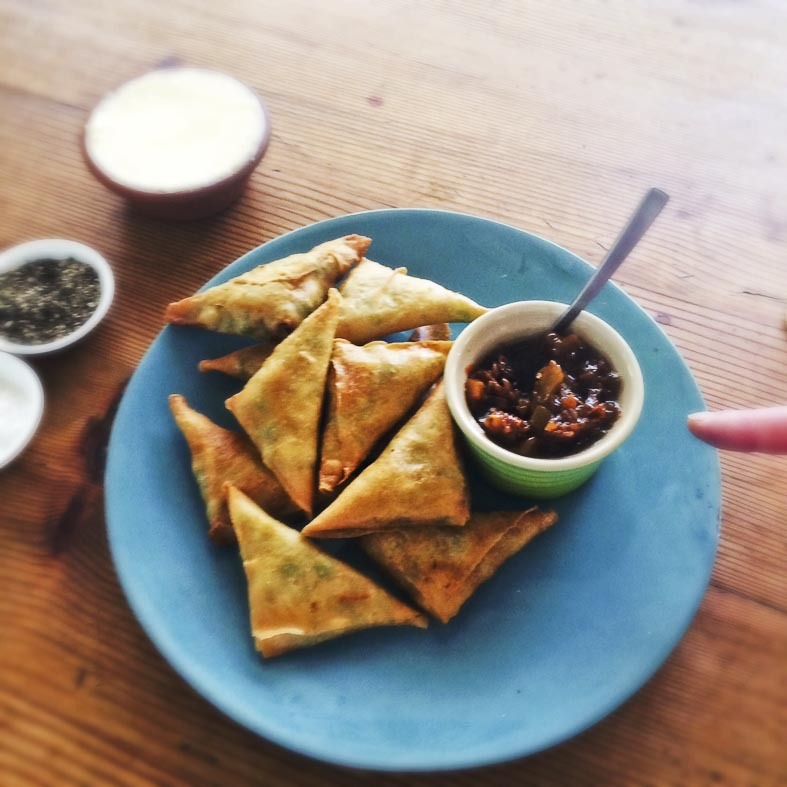 We’ve been making samoosas since the earliest days at African Relish. When Vani Padayachee was our resident chef, they were a fixture on her taste of the India courses. When she left, and there was a team change in the kitchen, the recipe for the pastry wrappers fell by the wayside. For a time, a good quality bought wrapper was used. Then Rowina Petersen came along. Rowina is now the resident chef’s right hand, but early on she showed a tremendous talent for pastry work. Not satisfied with the samoosas as they stood, she started researching pastry recipes. Google produced a few candidates that were duly tested, and she began to work with one particular recipe. Over time this was perfected. 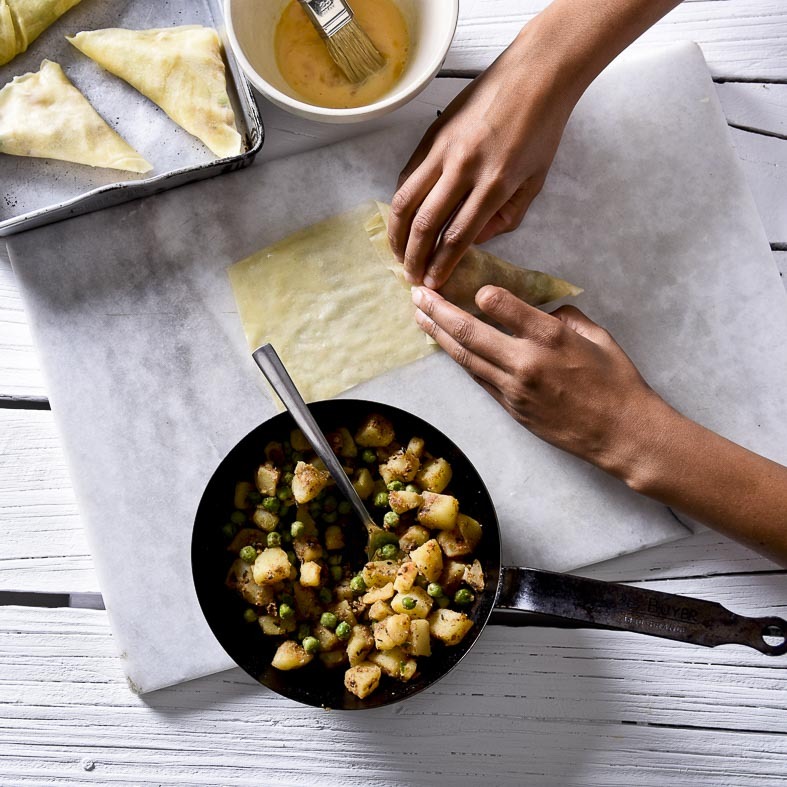 Ingredients were tweaked, resident chefs consulted and methods honed until she had created the signature African Relish samoosa wrapper. 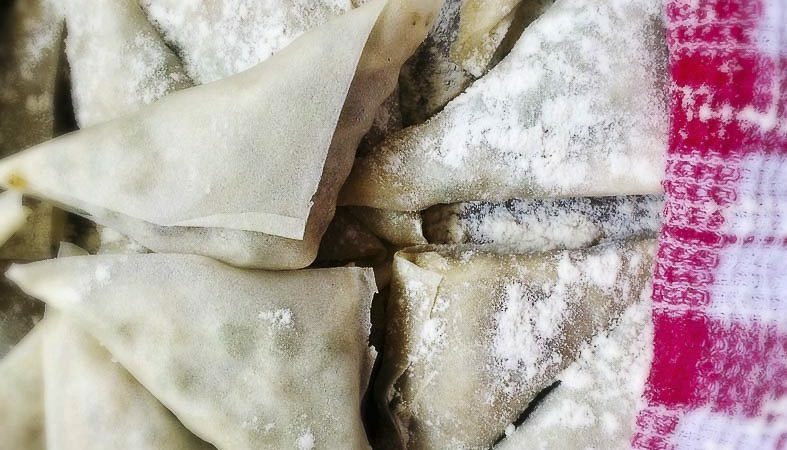 By the time chef Camilla Comins took charge of the kitchen in 2017, the samoosa occupied a cherished niche in our menus for weddings and function, and was a popular choice for recreational students in the cooking school. Such was its star status, that it was one of the first recipes we earmarked when work on the cookbook began in early 2018. (The recipe and instructions for folding appear on pages 86 and 87 of the book.) As one of the most requested dishes both in the cooking school and for functions, it had earned its double page spread in the African Relish Journal. While Camilla and her team were working with photographer Russel Wasserfall shooting images for the book, another evolution took place. The bullet-proof recipe, darling of the kitchen, took another leap forward. 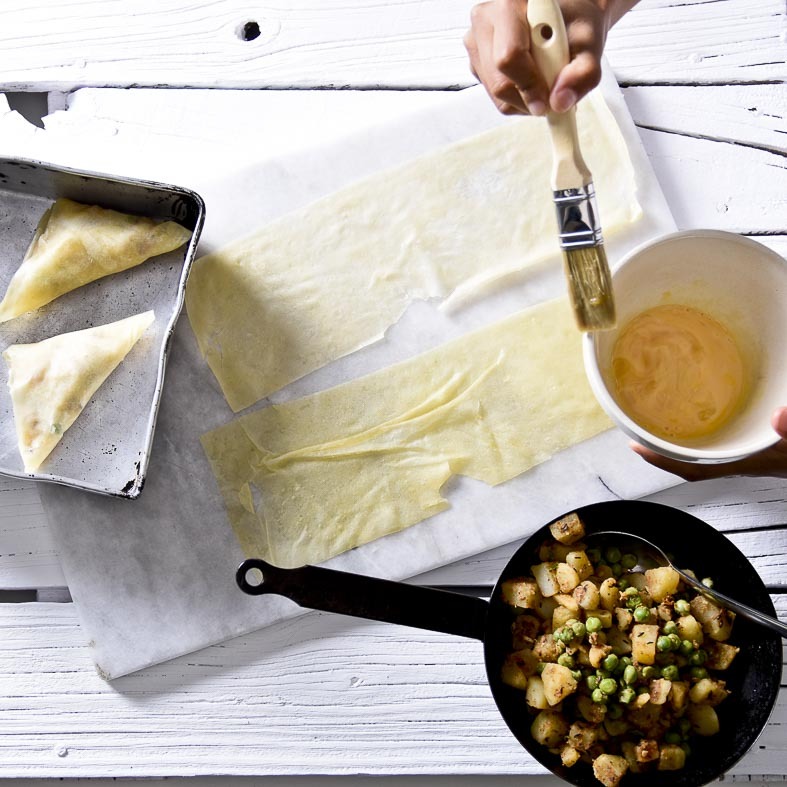 Over time, a potato filling had proved very popular, making the ‘driehoek’ a tasty starter treat for vegetarians. So although other fillings were occasionally flirted with, the recipe slated to appear in the book included the potato filling. As chance – and the constant cycle of recipe improvement – would have it, we included another staple from our Flavours of the East course. This one was a favourite recipe from personality chef Reza Mahammad. Reza had been a regular and treasured visitor to the African Relish kitchen from our earliest days. 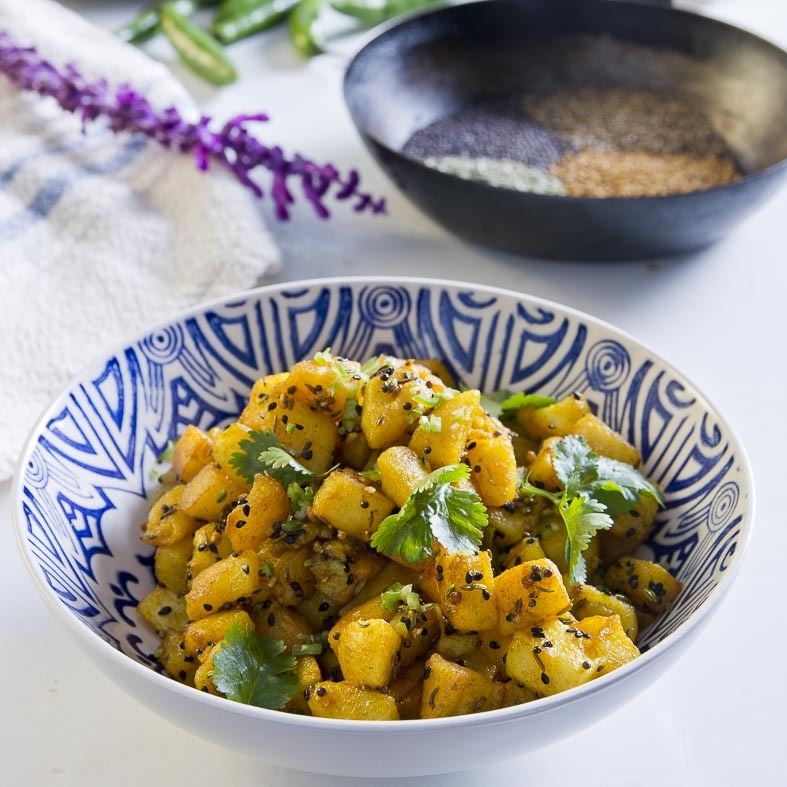 A number of his recipes continue to feature in our courses, but hands-down the most popular is his Five Spice Potatoes. It was short-listed for the book due to its simple elegance and because it always hit the spot with vegan visitors. 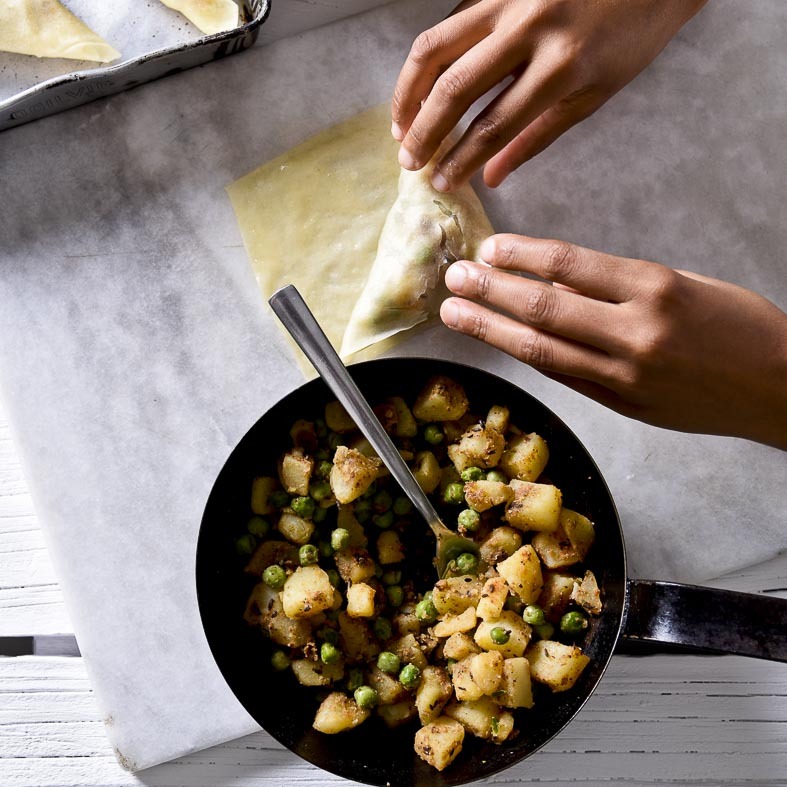 While preparing and styling the Five Spice Samoosas for the book shoot, Camilla commented that Reza’s recipe would “take the samoosa filling to the next level”. Never one to hang about, Rowina tried this when next she demonstrated samoosas for a class. The result is the recipe below. The original recipe (pages 86 and 87) in the AR cookbook includes the original filling. Reza’s dish is on page 18. To make things a little easier, we’ve combined the recipes here and paved the path to samoosa heaven. Blend the pastry ingredients in a food processor to form a smooth, soft dough. Divide into 90 g balls, cover with a damp towel and rest for 30 minutes. On a lightly floured surface, roll each ball into discs of roughly the same size. Layer 3 discs of dough with olive oil in between, dust with flour and roll out very thin. Place on the back of a well-oiled baking tray and trim the edges. Bake for 3 to 4 minutes or until it bubbles up. Remove from oven and cool under a damp towel. Cut the pastry (across the short side) into even, rectangular strips about a hand’s breadth wide. Dice the potatoes into 1cm cubes, or as close as possible. Try to get them all even. Heat the oil in a non-stick pan large enough to hold all the potatoes without crowding, or cook them in batches. Sauté the potatoes over a medium heat until nearly cooked. Add the turmeric and chilli powder, tossing to distribute evenly. Stir-fry thoroughly until the potatoes and spices have cooked through. While the potatoes are cooking, make the five spice mix. Use a small pan to heat the tempering oil until it begins to smoke. Add the five spices to the pan and mix together with a wooden spoon. When they are crackling and popping, and start to release their aromas, add the chilli and coriander. Stir for a few seconds to combine, then pour over the tempered spices over the potatoes. Add a squeeze of lime juice and set aside to cool. 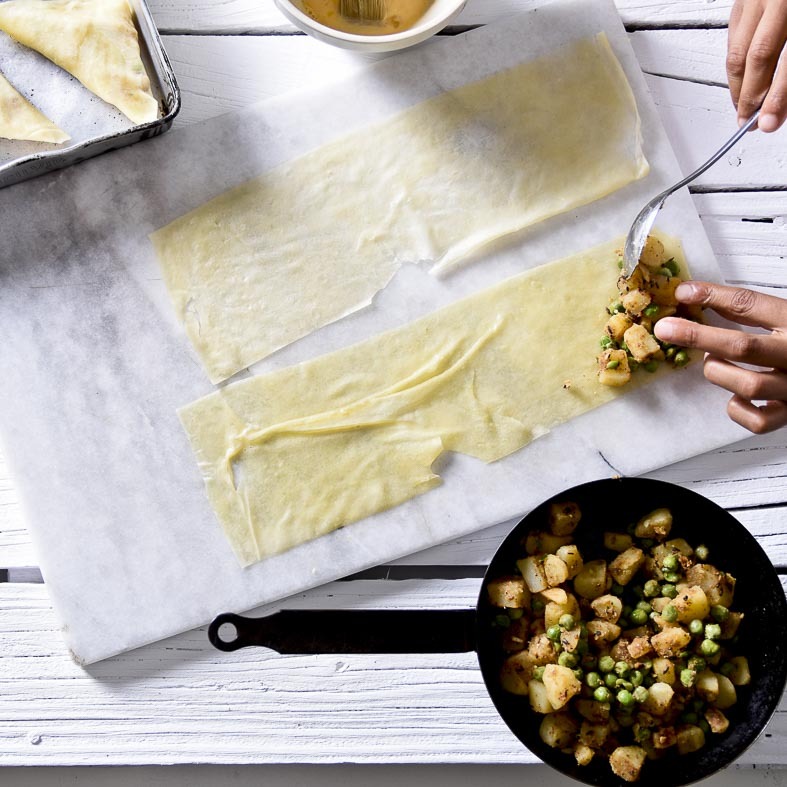 Lay a rectangle of pastry on your work surface – the short side should be closest to you. Now fold the pastry with the filling on it toward the empty side of the pastry. Repeat until the pastry sheet is used up. The first 2 folds are tricky, but practice will make you an expert. 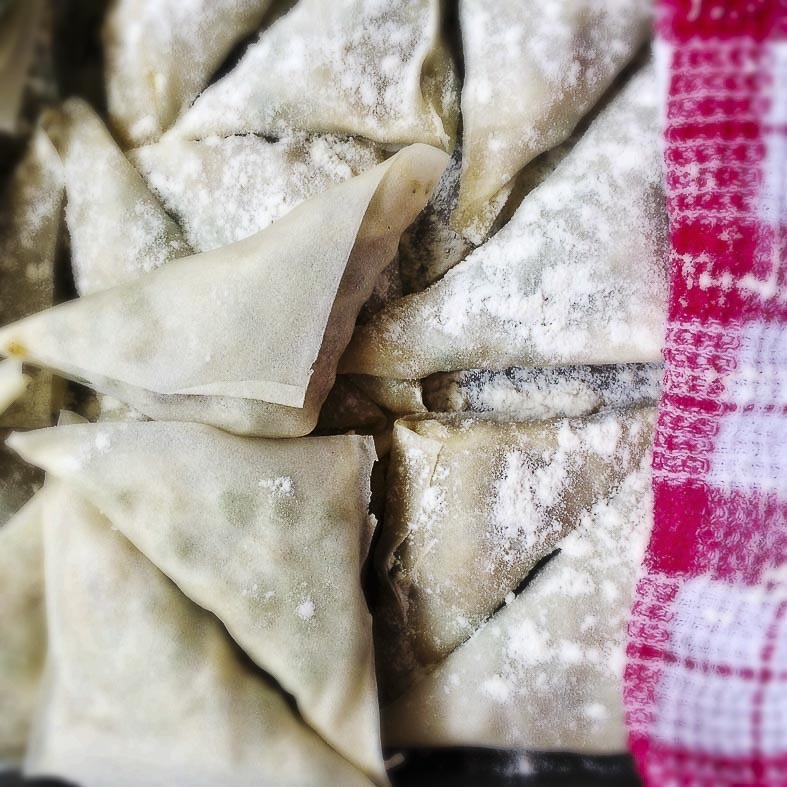 As you fold, place the samoosas in a dish, dust lightly with flour if you need to layer them, and cover with a damp tea towel. Deep fry in vegetable oil at 180°C until golden and crispy.